Tuesdays with Dorie Membership and Sticky Buns! Well, as if there isn't enough madness in the house, somewhere along the way, I decided to commit to weekly baking adventures with a group called Tuesdays with Dorie. Why you ask? I am not quite sure it could be the nesting kicking in or possibly just the fact that I love baking and it has already proved to be quite an adventure! So, this week's challenge was Honey Pecan Sticky Buns chosen by Madame Chow. Not only have I never made sticky buns but they were also yeast based and took considerable time with rising and such...it was hard to fit making these puppies into our crazy weekend schedule but I did and my husband is thanking me (again and again) for this one! And there is still half of the brioche dough in the freezer! You will find the recipe below...I substituted the butter for lactose free butter but other than that followed the recipe to the letter...well pretty much anyway. Now, prepare yourselves...this is quite the recipe! To shape the buns: On a flour-dusted work surface, roll the chilled dough into a 16-inch square. Using your fingers or a pastry brush, spread the softened butter over the dough. Sprinkle the dough with the cinnamon sugar, leaving a 1-inch strip bare on the side farthest from you. Starting with the side nearest you, roll the dough into a cylinder, keeping the roll as tight as you can. (At this point, you can wrap the dough airtight and freeze it for up to 2 months . . . . Or, if you want to make just part of the recipe now, you can use as much of the dough as you’d like and freeze the remainder. Reduce the glaze recipe accordingly). With a chef’s knife, using a gentle sawing motion, trim just a tiny bit from the ends of the roll if they’re very ragged or not well filled, then cut the log into 1-inch thick buns. (Because you trim the ragged ends of the dough, and you may have lost a little length in the rolling, you will get 15 buns, not 16.) Fit the buns into the pan cut side down, leaving some space between them. You know...when we had a boy I never imagined he would be so much like me! His ability to wipe out, trip over nothing and find the bumps in the sidewalk is uncanny next to my own. Add in a love of sticks, bugs and holes (why do boys always feel the need to put things in holes??) and you have our son. He is the sweetest thing if you ask me though. At almost 4 he is still full of cuddles and hugs amongst all of that 'boy stuff'. Anyway, onto my page now...this was a fun one to do. In fact I have been planning it for sometime so when I saw Tina McDonald's layout on Pencil Lines I was ready to go! I have to admit I have become a bit of a paper junkie lately so this is some of my new SU! paper in action...I have to justify it somehow! I think pregnancy must be getting to me because it seems to me that things have not been turning out quite right lately...look at these poor, mangled cupcakes!!! Sean was quick to console me...'It's okay Mummy, I don't mind'. I can't believe that that is what my 3 year-old is saying to me!!! Anyway, I cut off the extra bits and prettied them up...wanna see? Here they are!!! The kids have a Teddy Bear Picnic today at the library so I wanted to make beehive cupcakes. I think my icining is not quite stiff enough and to get the true beehive effect I could have used another layer of icing but I thought one layer was enough for the kiddies! Here is a final close-up...these were pretty fun and simple to make. DH was impressed with the icing job while I was mostly pleased that I had a bumble bee stamp that I could use to decorate them because I was looking for a sweet and simple way out! So today, the little guy and I will head off to the library while DH and our daughter head off to see the RCMP's Musical Ride at the fairgrounds. I hope everyone enjoys their morning!!! Alright...so here is the real reason that I have been slacking...a few weeks ago we starting working on building a patio in our backyard. So there was digging, jackhammering and tonnes of work going on. Sadly I do not have a before picture of this part of the yard but then again, maybe it's not that sad...it was in rough shape! Here is Martin working on removing rubble that was created as a result of the jackhammering. Fast forward to yesterday...(after having materials delivered and moving a whole lot of flagstone and putting this puzzle together!) Here are the kids helping with filling the spaces...this has been a true family project! The work crew enjoying their table on the patio. They were so excited about the promotion!!! Finally DH's first beer on the patio...not quite done yet (there are no stairs going to the door behind him yet!) There are still some details to put together but it is pretty awesome to have an idea what the finished product is going to look like! I know I have been neglecting my blog over the last few weeks...things have just been so crazy! My week to be spoiled is coming to an end...first Mother's Day and then a few days later it was my birthday so I have really been enjoying myself! I am so proud of my husband...he has really embraced being a stay at home dad (don't get too comfortable honey...I'm taking over soon!) He even baked a cake with the kids for my birthday!!! This is the first cake he has ever baked and iced!!! He apologized about the orange icing however it was the only colour in the fridge and he just couldn't bring himself to make icing too. 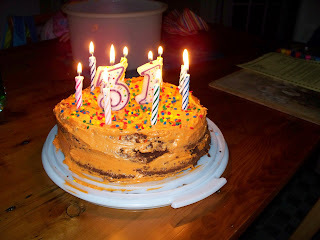 Don't worry honey, I forgive you...and no, I am not in any denial about my age...we just didn't have a #2 candle so they called it the anniversary of my 31st birthday! SWEET! I love being spoiled! It's been a great May! Happy Victoria Day to all my Canadian readers!!! Sorry I didn't get this up sooner! I didn't want to ruin the surprise for any of the Mom's that were recieving our Creative Kids Crafts this weekend and then I was having trouble with my photo editor yesterday! Our weekend was jam packed as well so I spent very little time on the computer! Anyway, this was an extra special treat that I made for the Mom's. Every session the kids get a little something from me to take home and enjoy. This time it was really for the Mom's! I used my Cricut to cut out the Dragonflies and Stamped the Happy Mother's Day on from All Holidays. The cookies are decorated using rolled fondant. Not sure if I like this method yet...I still have some experimenting to do! Now, here is what the kiddies did! They loved making the flowers! First we scooped some dirt into their jars (chocolate covered peanuts) then we used bamboo skewers to create the flowers! I know some of my mom's have been waiting to see this one come home since February!!! So here it finally is! We also made up little books out of stapled envelopes. We cut off the ends of the envelopes so that we could put little messages inside each pocket! It was a lot of glueing to do the decorating but the kids did great! I think the cutting was definitely the highlight though!!! I almost forgot to tell you...what can I say? I was so excited about getting those gifts posted as they are shipping out today! To celebrate my birthday (it's next week) I will be offering FREE SHIPPING on all Stampin' Up! Orders placed by 7pm tomorrow! So get your catty out and give me a shout! Did you know that today is Teacher Appreciation Day? Because Sarah likes everyone to be treated fairly (I can appreciate this) we are sending gifts for both her teacher and the educational assistant in the class. I hope they enjoy these sweet treats...what can I say? We are all out of apples over here!!! Since this is my 100th post and I am quickly approaching the 5,000 hit mark. You can expect to see some BLOG CANDY coming your way soon!!! So, keep a look out over the next week or so for some stampendous treats!